Dipping a sponge into a bucket of foggy water spiked with Epsom salts, Gloria Obregon wiped down the door frame in the counselor’s office at Fulmore Middle School in South Austin on Saturday. Others swiped desk tops, shooing dust. Obregon, the school’s dropout intervention specialist, said the space is a shelter for some students that have difficult family lives. “Now it smells good, there’s good energy, and there’s happy people in it,” she said. The scene had all the trappings of a typical scrub-the-corners deep-clean. Except for Stacy Davenport who took care of the less tangible gunk. Stepping gingerly around the room with a thin foot-long copper rod, Davenport paused as the limber metal started spinning counter-clockwise. The sudden rotation signaled bad energy. She waited until it righted, bobbing up and down. Davenport, a feng shui consultant who organized the event, said she thinks about peace during those quiet moments. About 12 volunteers, including two of the school’s students knocking out required community service hours, tackled the principal’s office, cafeteria and classrooms with cleaning supplies and essential oils to clear the campus’ bad energy. day, she said the school was a natural choice for volunteering her services. Saturday was Davenport’s second time clearing the energy at Fulmore Middle School. In 2006, she incorporated other elements of feng shui, painting the walls of the administrative office and installing wind chimes in the courtyard. She attributes a drop in absenteeism and teacher turnover in the wake of her work to the healthier environment she and about 30 volunteers labored to create. But not everyone is convinced, including some Fulmore teachers. To the skeptics, Davenport compares the energy she clears to a bathtub in an apartment that 20 people have rented. What would happen if you never cleaned it? This year, volunteers replaced red signs that urged students to stop bullying, name calling, teasing and threats with charts encouraging positive behavior. 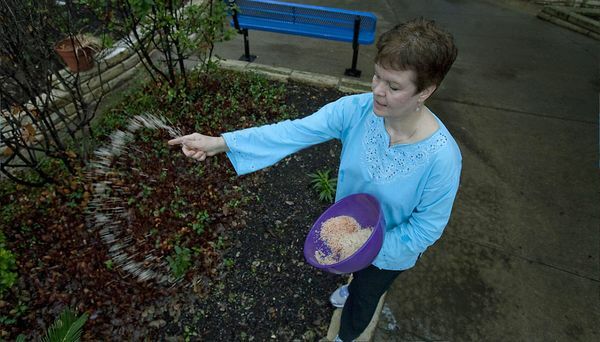 Davenport tossed a concoction of rice, rum and powder meant to clear the energy around the school’s perimeter. Eventually, she said, she hopes to clean one school in the district every month. Walking into a freshly cleaned room, Obregon exhaled. Read the article on Statesman.com.